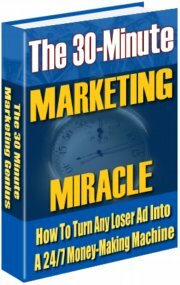 "The 30 Minute Marketing Miracle". Brett is known as "The 30 Minute Marketing Genius" as he has the uncanny ability to send business owners on their way to thousands (even tens of thousands) of dollars in extra profits, after just a 30 minute consultation! And in this eBook you’ll read and hear first-hand proof of that. But even better - Brett reveals exactly how you can quickly and easily grow your advertising results (and profits) too. -You HAVE full rights to sell this eBook. -You MAY sell it as a standalone product (it was designed to sell well this way). -The recommended sales price for this product is $39. -You MAY offer it as a bonus or bundle it into a package or membership site if you wish. -Your MAY NOT give it away as a freebie. Your customer MUST pay you something to receive a copy. -You MAY sell it from your web site. -You MAY sell it from online auctions. ... as well as all the information also in written form!